Little Painted Nails: Is Raider Nation the Hill You Want to Die On? The Oakland Raiders play again this weekend and I can only imagine it being another weekend of them being drubbed out of their own building. Being a Raider fan in the greater Denver area is uncomfortable business and something I wouldn't wish on anyone. In that "anyone" I include my daughter Macy. Macy has recently come out as a fan of the downtrodden organization and while a small part of me secretly cheers her decision, most of me would urge her to go a different direction. 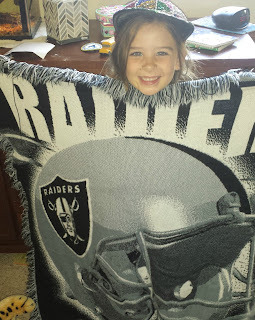 During every week of football season my little girl faithfully asks me "Did the Raiders win today?" and almost every week I let her know that they came in second. I imagine that her little head calculates that the Raiders are the silver medalist of the NFL. While I envy the world her naiveté allows her I can't help but think that being a Lions fan, a Steelers fan or even, gulp, a Broncos fan might make her precious life a little easier. Kowtowing to the masses isn't generally the stance I take, but my mother always told me to ask the question "is that the hill you want to die on?". In my life I didn't ask that question enough. I didn't ask the question when I wore a haircut that would make the Flock of Seagulls blush, I didn't ask it when deciding on getting an English degree and I certainly didn't ask it as I was growing into a Raiders fan. Girls, the moral of the story is this, it's okay to be different, in fact, it's fantastic. As you grow up you can dye your hair, get a nose ring and study the philosophy of pottery making if that is what makes you happy. But as someone who never did, I would recommend that you pick your battles a little more intelligently than I did. It's fine to have neon purple hair because that's what you want, but it's also okay to join the tennis team because that's what all of the other kids are doing. This applies especially to you, Macy. You are an adorable girl, one who loves Bob Marley and the Beastie Boys. You have a wonderful sense of style and who knows, rain boots, jeans and a tutu may one day be all the rage. You are a unique and magical girl but what makes you awesome also makes you a little different. Perhaps the addition of wearing the "kick me" flag that being a Raider fan brings may not be for you. As a dad I want the world for you and in that world I want you to be yourself but fit in as well, to be able to let your freak flag fly but to do it with your feet firmly on the ground. Just know that no matter what you do and who you become, your Daddy will always love and support you, even as a green haired, philosophy studying Bronco fan.